Get free advice and estimates from kitchen designers in your city. Searching for an additional freezer can benefit the home by providing extra space for bulk sizes of meat, vegetables, and other items. Those who prepare meals ahead of time may need more space for these items. Because many refrigerators do not have large storage spaces, another freezer might be required. In this guide, we explain the differences between a chest versus an upright freezer and which may be best suited to your needs. Chest freezers sit horizontally on the floor and are deep in comparison to upright freezers. This may be ideal when adding food items into it, but it also means that you will have to dig for older items. On the other hand, upright freezers look a lot like refrigerators. They stand vertically and work in the same way that a fridge does to hold the items on the various shelves and compartments. They are more space-saving than chest freezers, which makes it easier to find space in the home. They can easily slip in areas where there is less horizontal space. 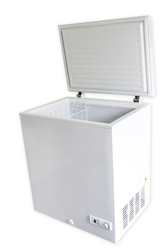 Chest freezers tend to be wide in length and width, making finding a spot more difficult. Chest freezers are more energy-efficient than upright freezers. Generally, they cost a little more than $4 a month to run when divided. Upright freezers cost around $14 a month to run. Both options come in energy-efficient models, which can further your cost savings. Chest freezers use an airtight locking seal at the top to keep the food inside fresh and frozen. Due to this, it also means that less energy is used to keep the container cool. 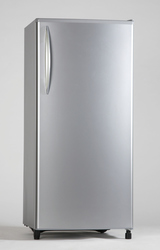 Upright freezers have smaller gaps in the door mechanism, which can take more energy to keep the food cold. Also, if the power in the home goes out, chest freezers can keep food frozen for 2 to 3 days at a time. This is again due to the seal on the outside rim of the freezer. Upright freezers can only keep things frozen for one day at a time. Additionally, chest freezers have to be manually defrosted, while upright models come with an auto-defrost option. This means that the frost is removed from the inside of the freezer. Generally, a chest freezer needs to be unplugged, drained, and then cleaned while the upright defrosts itself. Both of these freezer options are available in different sizes, which provides more or less space as required. However, the way the food is organized on the inside of the freezer makes a huge difference. Chest freezers have only a wire basket inside them to provide organization, which means that other food items can become buried under one another. Also bending, lifting, and moving is required to find what you’re looking for. This can become tiring when you’re searching for a small bag of peas but have thrown bags of meat on top. However, due to product innovations in the freezer industry, many chest freezers now have additional storage baskets and compartments that can be used to make organization easier. Some models have drawers that can be pulled out and used for quick access. This makes using a chest freezer more bearable, although the user still has to bend over to access the items or remove baskets. Upright freezers have shelving compartments in them, much like a fridge. This provides an easy way for items to be neatly organized on different levels throughout the freezer. In the past, upright freezers were thought to be more convenient for this reason. However, larger frozen items are not going to fit well in the freezer due to the shelving compartments. This reduces the space vertically, giving no room for tall items, such as a large turkey or ham. Since a chest freezer requires more room, it is important to ensure that you have the right amount of space. Installers check to make sure there is enough headroom above it to lift the top. Additionally, there should be an electrical plug in the area for the freezer when installed. Upright freezers require less floor space, but the door has to have enough room to swing open in the right direction. There must be at least an inch behind the freezer at all times, so it cannot be installed flush against the wall behind it. There should also be an accessible plug in the area. The cost of materials for a 5 cubic foot chest freezer is $150 to $250, with labor costing around $100 for installation on the first floor of a home. However, installation costs can run between $100 and $250 depending on the size of the unit, floor it is going on, and any extras required. Therefore, the total cost for a 5 cubic foot chest freezer is between $250 and $500. Upright freezers range in price by size, but the variations of price are not too far apart. Additional extras such as locks and keys for the unit can also cost a bit extra. The cost of materials for a 14.4 cubic foot upright standard freezer is $300 to $350, with installation running between $100 and $300. Therefore, the total cost for a 14.4 cubic foot chest freezer is between $400 and $650. Maintenance of the chest freezer is a bit more involved than that of the upright. This is mostly because the chest freezer does not have an auto-defrost option. This means thawing out the freezer, draining it, and then cleaning out the inside. Additionally, bending over and going deeper into the freezer can be tiring on the back and legs for some. Upright freezers can be placed on the auto-defrost option and then wiped down. This takes less time and gives less of a headache and backache when cleaning out the inside of the freezer. Neither is safer than the other, and they both come with locking choices depending on the model. Purchasing any freezer may pose safety concerns when children are around. Children can easily open the lid to the chest freezer and climb inside, just as a child can get into the upright freezer. Some models have locking mechanisms to make it safer for children. Locks can also be purchased and added to some models. While this is not a necessity, it is an important aspect for those with small children to consider when purchasing a freezer. Chest freezers tend to have longer lifecycles than upright choices because of the way they are made. They do not overheat, do not have issues with leaking fluids, and are built with long-term use in mind. Chest freezers are expected to last between 15 and 20 years, while upright freezers have a life expectancy of 10 to 15 years. How much does it cost to install a chest or upright freezer in my city? Cost to install a chest or upright freezer varies greatly by region (and even by zip code). To get free estimates from local contractors, please indicate yours.